Topo Athletic is a newly minted brand directly catered to the fitness industry. Their product line places a high level of focus on running, providing gear and footwear to take on any terrains. One of their most influential products to embrace the running space is their Topo Magnifly running shoes. This model has been uniquely designed to accommodate both genders, making it a candidate for embrace by all types of runners. 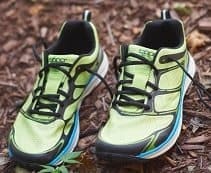 Below is a detailed product review of this Topo shoe model. We will also provide lists of pros and cons to help guide you through the purchasing process. These shoes work great to meet the needs of my workout routine. When I exercise, I am performing a complex collection of movements. My feet do not shift, and my ankle is kept in place throughout these movements. This is a great partner for the gym. Check Price on Amazon! At first glance, one will notice the unique design of the Topo Magnifly product line. Detailed attention is placed on the midsole, undercarriage support, and creating a wide toe box. These three features just touch on a few of the components that make up the shoes, with many others to draw information from. Let's go over some of the top pros and cons with these shoes. Overall customer satisfaction has been historically high for this model. These high levels of praise are extended to additional products within the Topo Athletic brand, making it a popular destination for quality products. A toe box that accommodates both the toes and the forefoot. This allows for your foot to rest in a natural position, reducing cramming and squeezing into a tight housing. This component will bode for a positive comfort level. These shoes are termed as minimal. This means they bring you an experience that is close to running with bare feet. This is an important element to helping you discover your strides or increase the effectiveness of your running routine. The build-up and reinforcement measures introduced in the outsole and back of the heel create for more support. This reduces internal movement and protects your foot from common ailments associated with improper fits. Cup introduction found in the heel and midfoot area keeps your footing and helps to implement proper holding patterns. This grip is reinforced with cushioning, reducing the feel of this applied pressure. This model makes for a nice lightweight option. Reducing the overall weight allows you to focus more on your running and not having to accommodate for heavy footwear. Breathability introduction gives your foot the proper air circulation amounts. This also plays a major role in preventing blisters and other such air-tight ailments. Increased instances of usage through implementation of traction patterns and other such grippers. This makes this model a perfect fit for any activity; not just a running shoe. Find your color with patterns that expand upon the color wheel. Unique designs combined with different shades allow for you to discover the right pair to meet your fashion needs or wardrobe. When compared to the major running shoe brands, the price point comes in at the low-end of the marketplace. Spend less money and reap the benefits that many of these more expensive models would host. The minimal nature might be uncomfortable for some users. Those who have flat feet or have experienced some sort of foot injury would find this model to sit too close to the ground. Those who have narrow feet might find the shoes to be a little too wide. This shoe houses a large toe box that extends to the midfoot, increasing the slippage rate for those who have narrow feet. Stiff at the start. Some people prefer to run in their shoes the second they get them, which isn't recommended with this model. They need to be broken in before heavy usage rates, which is a direct relation to the initial stiffness experienced. The heel rise is rather minimal, which may turn some people away from the product. Shoes that surround the entirety of the heel helps to increase the holding pattern that a shoe possesses. Now that we have introduced some of the pros and cons of the product, it is time to break down the product into differing categorical components. Each section will discuss a certain aspect of the shoe and will detail the elements important to that region or area. The design of the shoe directly influences a comfortable fit. The implementation of an increased toe box size and a foot surrounding allows for the foot to rest in a natural position. No more cramming into these areas. The fit can be best described as natural and relaxed. This extra space often influences the promotion of developing better running strides and reduces the pressure on the foot. Size runs rather true, with a ½ size jump being prescribed for those who have sampled from the other major running shoe brands in the past. The outsole is strengthened and reinforced through the stacking of rubberized materials. This material is thick in nature, which directly reduces the pounding and shock amounts experienced out on the trails. This rubber design is compiled through the use of carbon elements, helping this model to carry the lightweight stamp of approval. The stacking mechanism is utilized in the back portion of the shoe, which caters directly to increased heel support. While the back of the shoe contains the most support, this stacking technique comes in a 3-piece notion from midfoot to heel and 2-piece notion from midfoot to toe box. Both of these mechanisms combine to produce a solid outsole that supports the foot in many different facets. The midsole is made of EVA materials. This is a fancy way of introducing the notion of a foam midsole. The midsole holds an important place in the construction of the shoe, due to its ability to reduce wear and tear of the foot and reduce the amount of shock and pressure felt. The "placement and importance of a solid midsole" cannot be understated, meaning it should host a prominent position in the shoe makeup. The Topo Magnifly introduces this portion in a thick nature, which represents an added comfort bonus. It runs throughout the entire length of the shoe, applying a sense of support and stability that is felt throughout your runs or daily usage. The upper portion of the shoe features a minimal rise, but introduces holding mechanisms within the shoe. While most would prefer a shoe to fully encompass the ankle, Topo makes up for this feature by adding synthetic and mesh padding to this area. This helps with the holding stance, keeping your foot stable and in-place. The upper is constructed from the same synthetic and mesh material makeup, keeping the lightweight notion throughout the entire shoe. The back of the heel is straight and utilizes additional materials for increased back padding. This helps to keep a straight hold on the ankle, reducing the amount of movement or slippage when you are out on the running path. The weight of this model remains on the low-end of most comparable models. Introducing all of these features and benefits, it becomes an amazing feat that the weight can remain so low. The average size 9 men's model comes in at 8.8 oz. in total weight, which is an achievement that is rarely met with models that house comparable features. This weight amount directly benefits increased attention to running form, styles, and patterns. No longer will you have to accommodate for your footwear with the lightweight Topo Magnifly models. The mesh and synthetic design are directly attributed to breathability associations. The mesh is like a netting, puncturing little holes throughout the outer covering. These holes do not introduce direct paths for elements to enter the inner portion of the shoe, due to the implementation of the synthetic materials. Together, these two sources help create instances of better air flow throughout the top covering of the shoe and reduce the elements that can reach your feet from external methods. Comfort is one of the greatest benefits this shoe hosts. The comfort introduction starts with the additional space created in the toe box and the midfoot area. This wider fashion allows for your feet to sit naturally, reducing cramming and creating a direct reduction to common ailments in the running space. The footbed features a removable insole, which can bring your feet closer to the ground. This insole is treated with a synthetic covering, helping to create a greater reduction of shock pressures. Shock pressures are also eliminated through the solid construction detailed in the outsole. The total package of this shoe helps promote reduced pressures and increases the staying power of the foot throughout travel means. The reinforcement in construction is a telling point for the durability with these models. The carbon rubber elements are used to create methods that increase the life of the shoe. Carbon rubber is a stronger force than regular rubber. Regular rubber stands to tear and split over time. The carbon method reduces these occurrences, allowing you to get more use out of your shoes. Utilizing both synthetic and mesh materials also helps to increase the lifespan of this shoe model. The duality of these forces helps make up for what one may lack, partnering the strength to last a longer period of time. This model is also supports to notion of increased instances of usage. The lightweight nature supports long-standing success over prolonged usage, making them a great option for daily wear or for those who spend a majority of their days on their feet. This notion is also supported for those who run regularly or are training for long-distance running. 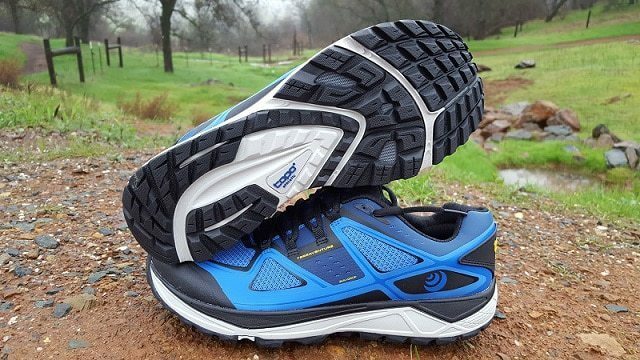 Grippers and a patterned traction implementation make for great off-road running conditions. These elements help to reduce slippage and increase traction on adverse surfacing, catering directly to the trail running market. There really isn't a space where this shoe couldn't fit into, making it a fitting option for all terrain types. Stability is increased through the introduction of unique holding patterns. A heel cup is added to keep the ankle stable and sturdy throughout movements. These elements are added to make up for the lack of rise around the ankle. Stability is also increased through the construction of the outsole and midsole. The stacking method mentioned earlier occurs at an even keel, keeping these support measures relevant throughout all instances of push-off and landing. The carbon rubber makes for a more flexible component than regular rubber would. It is important to host flexibility in the toe box and the rear heel area. This shoe provides ample amounts of flex in these regards, which directly influences instances of push-off and landing. There is also limited twist flexibility, which is a positive sign for running shoes. Too much flex can cause the foot to move and be at a more direct risk of feeling shocks and pressures. With some sizes in the Topo Magnifly product line, users may find limited amounts of availability. Below is a list of product alternatives with brief reviews of what makes them solid comparisons to the Topo Magnifly model. The Mizuno Wave Sonic running shoes feature a similar makeup to that of the Topo Magnifly shoes. These shoes are constructed of synthetic materials, creating yet another similarity between products. This shoe utilizes less components of build-up in the outsole and midsole area. This area is made up of rubberized material, as opposed to the carbon rubber in the Topo makeup. The price point is higher on this model, likely due to the recognizable brand name in the sporting world. 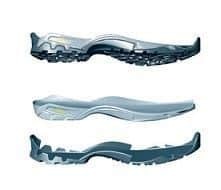 This shoe also combines to use the low-profile method that keeps the user closer to the ground in the minimal sense, a feature that the Topo Magnifly shoes also possess. Adidas is a widely known and accepted name in the sport world. 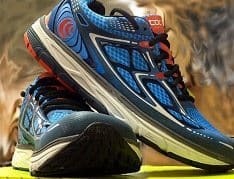 Their Energy Cloud running shoes cater to some of the same elements that make up the Topo Magnifly running shoes. This shoe starts at a relatively similar price point, which makes a great starting point for comparison value. It utilizes a single layer of padded rubber on the outsole, which is significantly less than the Topo model. It minimalizes the use of heavier materials, giving it that same lightweight title hosted by the Magnifly runners. Synthetic material comprises the general makeup of this product, which makes for a similar makeup means to that of the Magnifly runners. Brooks is a brand that is known for their high attention to detail. The Launch 4 shoe model encompasses this stance. It is constructed from high quality materials and shapes to fit the low-profile nature of the Topo Magnifly running shoes. It introduces a thick rubber sole, which meets the standards of thickness found in the Topo Magnifly model. The synthetic and mesh combination is also hosted by this brand, which makes it likeable in breathability, support, and comfort standards. Most of the elements found in the Topo Magnifly runners can be found within this Brooks model. The major difference is the price point, with Brooks featuring the more expensive market option. On a personal note, I find it productive to find shoe models that meet adversity standards. Most shoes will be implemented to cater to a specific environment or space, severely reducing the usage rate amongst a wide variety of individuals. Topo really answers this call by finding areas of the shoe to host new advancements and sound construction means. They have really answered my call and the call of all individuals looking for a brand to stick behind for all areas of prescribed usage. The multi-dimensional tone that the Topo Magnifly runners brings to the table is a feat that will not soon be overcome.